Boothby Street residents say their family has driven across city property for 70 years and want to keep the city from blocking their route. 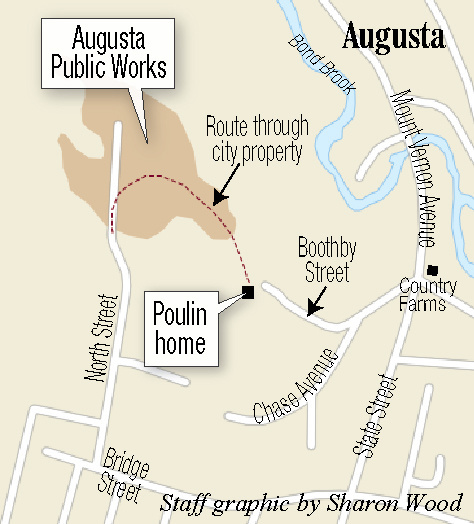 AUGUSTA — Boothby Street residents who say their family has driven across city property to safely get to and from their home for 70 years without incident are suing Augusta to prevent it from blocking off their access across the public works site off North Street. An attorney for Monique and Robert Poulin, and Monique Poulin’s mother, Lorraine Piteau, filed suit against the city and Augusta Public Works Department last Monday. The suit alleges that if the city makes good on a threat to block access to their driveway, it will jeopardize their safety by cutting off the only access they — or potentially an ambulance crew — have to their home other than a steep flight of 100 stairs. City officials, while sympathetic to the plight of the family living in the unusually-located home, said allowing access to it across the city’s busy public works site — between sand piles and moving pieces of heavy equipment — would open the city up to liability, safety and security concerns. The home, with an address of 74 Boothby St., was built in 1948 by Robert Poulin’s father. Monique Poulin said it has been primarily accessed all that time by cutting across what was first the city dump, and since the 1970s the public works headquarters, to a driveway that leads to the family’s home at ground level. An attorney for the family said they have no choice but to sue the city to prevent their access from being block, for their own safety. The lawsuit states that if the city were to block the driveway, the family would have no vehicular access to the home. And that without being able to drive to and from her residence, Monique Poulin could lose her job. Monique Poulin, 53, said both her husband and mom are disabled. The 73-year-old Piteau, who moved into the home to live with her daughter and son-in-law about three years ago, has dementia and has had hip replacement surgery. She is usually driven to an Alzheimer’s center three days a week, which Monique Poulin said helps prevent her from becoming depressed by getting her out of the house for a while. In an affidavit filed with the lawsuit, Piteau said going up or down the many steps to the home is difficult and dangerous for her, and she can only do it if she has someone to help. Robert Poulin, 59, has had back surgeries that left him permanently disabled. He said in an affidavit he is not able to negotiate the stairs and, without vehicular access, he would effectively be a hostage in his own home. Monique Poulin drives to her home on Nov. 13, which abuts Boothby Street, by going through the pits located at the Augusta Public Works facility. City Manager William Bridgeo said he’s sympathetic to the family’s circumstances but now that city officials are aware they are crossing the active public works site to get to and from the home, they can’t allow the practice to continue. “I’ve been thinking about this a lot the last couple of nights, because it’s not fun to be part of something that causes this type of hardship to people,” Bridgeo said Tuesday. “I know members of the City Council sympathize with their circumstances, and I sympathize with their circumstances. But I don’t know what the answer is. Bridgeo said allowing the public to have around-the-clock access to the public works site, where dump trucks and other pieces of heavy equipment are on the move, especially in the winter, could put both those members of the public and city employees in danger, and create liability problems for the city. And allowing the family to pass — at any time of day or night — through a gate on the public works site that is now normally closed nights and weekends, could compromise security of the public works facility. Davis said the family offered to sign an agreement absolving the city for any liability should a member of the family be injured while crossing the site, but city attorney Stephen Langsdorf said the municipality would not sign off on the agreement. “We’d never hold them liable for anything, we just want our access that we’ve always had,” said Monique Poulin, noting her husband lived in the home all his life, his father built the home, and there have been no accidents in the 70 years family members have been using the route. Bridgeo said such an agreement would do nothing to address concerns about security and safety on the site, and the city could still be liable for any injuries suffered by a public works employee if an accident involving a member of the family crossing the site were to occur. The family also seeks a temporary restraining order to prevent the city, before the court case is heard, from permanently blocking the driveway that crosses public works, which Monique Poulin said city officials said they would do Friday. A court hearing to consider the request for a temporary restraining order is scheduled for Wednesday. Bridgeo said he didn’t know the family had been accessing their home across the North Street public works property until Monique Poulin approached the city this year. She asked for an access card, like those held by public works employees, so she could open the gate at the site on weekends and at night so she could drive to her home that way. They’re now able to leave the property through the public works gate site even when the gate is closed, because it opens automatically when a vehicle approaches from inside the property. But Poulin said she is unable to get back through the gate when public works is closed. 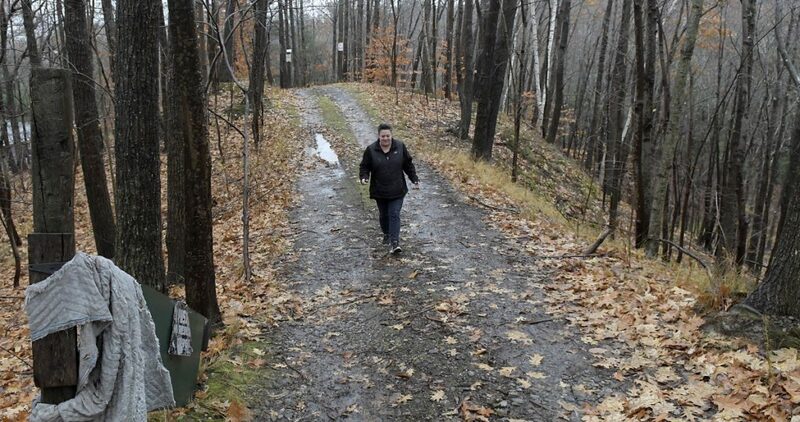 Lesley Jones, director of public works, said previously she had seen Poulin going in and out across the city property before, but she thought she just did so once in a while — when the gate was open — and thought they usually accessed their home from Boothby Street. Poulin said public works employees used to recognize her and wave when she passed, though she said they don’t wave anymore. In September city councilors discussed the issue and, while not voting, expressed no interest in allowing the family to have an access card to be able to get through the gate at all times. Langsdorf expressed concerns that now that the city knew of the practice, it could face liability problems if it did not stop it, and the city should block the road. 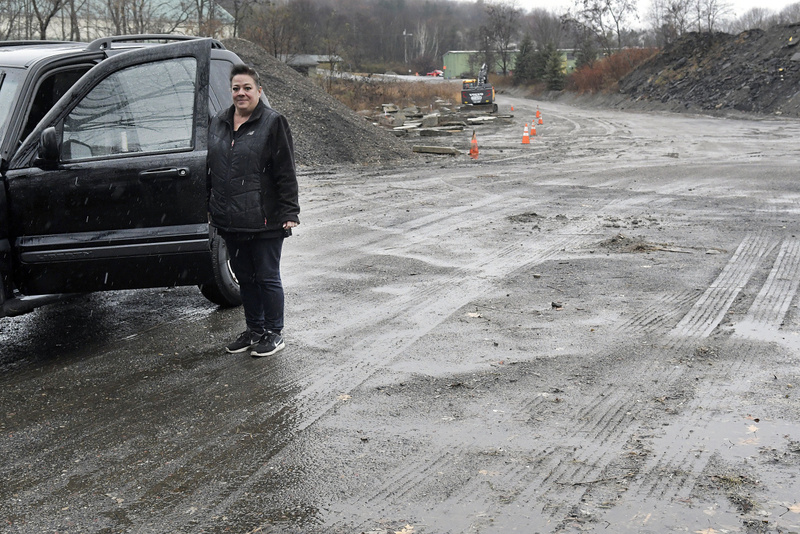 In June, according to Monique Poulin, public works employees blocked the entrance to their driveway by putting concrete barriers across it where their driveway meets the public works site. So she called Davis, who called the city, and the barriers were removed later that day. Monique Poulin said it’s difficult for her to maintain the staircase, especially to keep it clear of ice and snow in the winter. She said it would be impossible to maintain their home if contractors and deliveries of supplies can’t use their driveway and could only use the long steep staircase. She said when she gets out of work she hurries to complete any errands so she can get home before the gate is closed.